These are often called holistic, alternative or integrative health services and every year more than 35 million adult Americans make use of them. That is why the Affordable Care Act contains provisions that will for the first time make insurance coverage for these services reflect their everyday use by those Americans and the many more who will use them as they become more affordable. Telling stories from all across America where these therapies are bringing relief and restoration of health to people. Telling how these therapies are finding their way into standard medical practice: in medical education, in everyday care and in programs of wellness and prevention: in cancer, pain management, chronic disease, and stress management. Providing The 2706 Toolkit and connections that can help you make the case in your state. Describing the substantial medical education and professional certifications that practitioners in these disciplines must obtain in order to win licensure in their state (shown in the section on The Professions). We welcome your thoughts comments and especially your participation in helping to make insurance coverage for these and all licensed healthcare services a reality. CoverMyCare is made possible by the support of the Bastyr University Center for Health Policy and Leadership, the American Massage Therapy Association, and the Academy of Integrative Health and Medicine. Read more about our sponsors here. CoverMyCare is a project of the Integrative Health Policy Consortium (IHPC), a federation of the professional integrative practitioner associations who represent more than 400,000 providers who serve millions of Americans every year. Read more about IHPC here. Taylor is principal at Integrative Health Strategies in Washington, DC. Taylor conceived, developed and manages CoverMyCare for IHPC. He has consulted for integrative health and medicine and organizations on strategic content and social media initiatives. He has also written about the development of integrative medicine and health for John Weeks’ The Integrator Blog, for the Altarum Institute’s Health Policy Forum, and for Glenn Sabin’s FON Consulting. Susan is the Interim Executive Director of the Integrative Health Policy Consortium, producer of CoverMyCare. She is also principal at Transformative Heath Solutions Group. 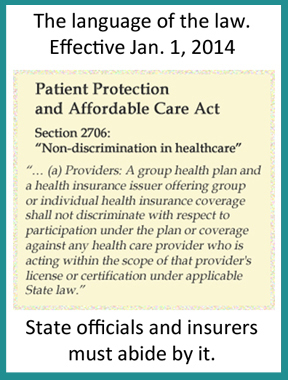 CoverMyCare works closely with advocates in US states who are working to advance the compliance with Section 2706 and other non-discrimination rules in their states. CoverMyCare was created with the contributions of IHPC volunteer committees who work on issues in healthcare policy in Federal Policy, Non-Discrimination, Education, and Marketing. Thanks also to IHPC board members and their colleagues who coordinated content contributions in massage therapy, naturopathic medicine, homeopathy, acupuncture and oriental medicine, and chiropractic.